The New York Islanders have eliminated the Florida Panthers, which means they’ll venture on to the second round of the playoffs for the first time in 23 years. John Tavares had the winning goal in the second overtime period, giving his club the 2-1 victory on Sunday. The 25-year-old from Mississauga also had the tying goal at 19:06 of the third period. He finishes the first round with five goals and four assists in six games. He registered 30 shots on goal and was effectively dominant in all situations. In the last two games of the series, Tavares had over 30 minutes of ice time. This is a big victory for the Islanders for a multitude of reasons and even yours truly botched the prediction. The Panthers looked to be the deeper team on paper, but Tavares and Co. came to play. Kyle Okposo was a big part of New York’s playoff success. He was a point-a-game player, with six points in six games. He notched an assist on Sunday and had eight shots on goal. He had 28 shots on goal in the series. Franz Nielsen and Brock Nelson also shouldered the offensive load. Islanders netminder Thomas Greiss was often stellar. He stopped 41 of 42 shots on Sunday, only allowing a goal by Jonathan Huberdeau late in the first period. Greiss took his inexperience in the post-season and shut down the critics, closing the door when he had to. Surely the Panthers had higher hopes, especially with Jaromir Jagr playing like a man possessed in the regular season. In the post-season, however, the 44-year-old couldn’t get much going. He was limited to two assists and registered 20 shots on goal, but the Islanders did a good job in limiting his chances. 33-year-old centre Jussi Jokinen had four points in six games, including three assists, but he was limited to seven shots. If anyone was really firing the puck for Florida, it was Huberdeau. He may have only potted one goal, but he registered nine shots on target in Game Six. The 22-year-old finished with 34 shots and he was on the ice for many critical moments, logging almost 33 minutes on Sunday. Only Aleksander Barkov had more ice time in the series-deciding game. And then there was goalie Roberto Luongo, who played very well in his return to the post-season. The 37-year-old stopped 49 of 51 shots on Sunday and logged a lot of minutes in the series – including three overtime games. 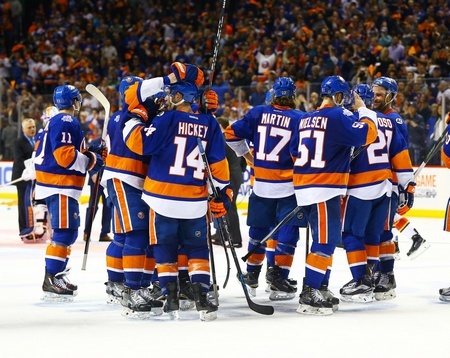 The Islanders were able to take advantage of the Panthers’ shortcomings and put the series away, plain and simple. And now New York will face off against the Tampa Bay Lightning in the second round.